This large 1000 piece beautiful atmospheric puzzle is showing London City at night. The image features Big Ben, London Eye and many more tall buildings and tourist favourite spots in London. A bright night scene with full lights is everyone's admired view of London. Bring London to life with this large puzzle! 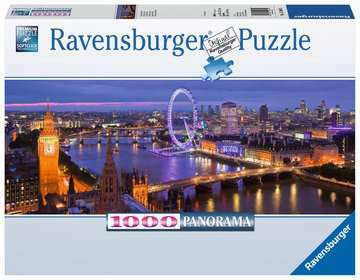 The puzzle has high quality pieces and uses Ravensburger's "Premium Puzzle Softclick Technology". Finished puzzle measures 69.9 x 49.7cm when complete.